Woody Bogler Trucking Company specs its tractors and trailers dedicated to end dump service with efficiency in mind. Light and fuel efficient tractors coupled with light but strong trailers, equates to more payload per trip. More payload per trip equates to the most material being moved in the shortest and most responsive times possible. Our drivers will move your material quickly, safely and on time. Woody Bogler Trucking Company maintains one of the largest end dump fleets in the Midwest. This capacity allows us to service the needs of customers who have large stocks of material that they need moved. Achieve operational efficiency by only having to work with one carrier that has the capacity to move large quantities of material. 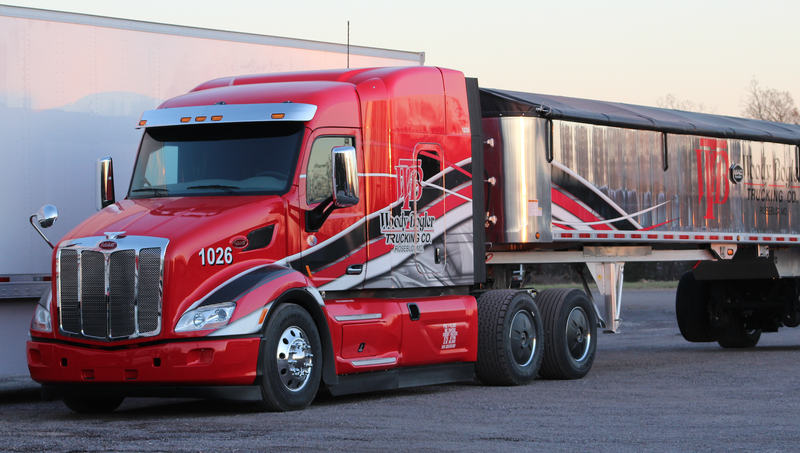 Feel confident knowing that our fleet of new trucks, staffed by professional drivers, will get your freight picked up and delivered safely and on time every time. Our Peterbilt tractors dedicated to end dump service are equipped with 58” sleepers geared toward driver comfort. We do this because having happy drivers helps us maintain the level of professionalism and responsiveness that our customers deserve. We are experts at moving large quantities of material on trips that require transit times over multiple days. Woody Bogler Trucking Company is also committed to being environmentally responsible. We were a recipient of the 2018 EPA SmartWay Excellence Award. 40 Companies were chosen from over 3,700 companies and organizations participating in SmartWay. To schedule a consult with our representative, please fill out your company's info and we will get back to you shortly.